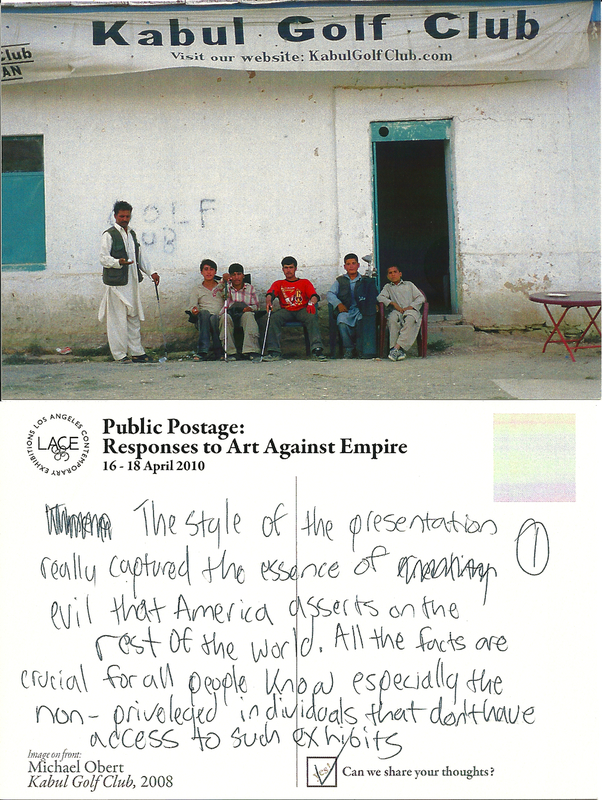 PUBLIC POSTAGE was installed for the closing reception of Art Against Empire: Graphic Responses to U.S. 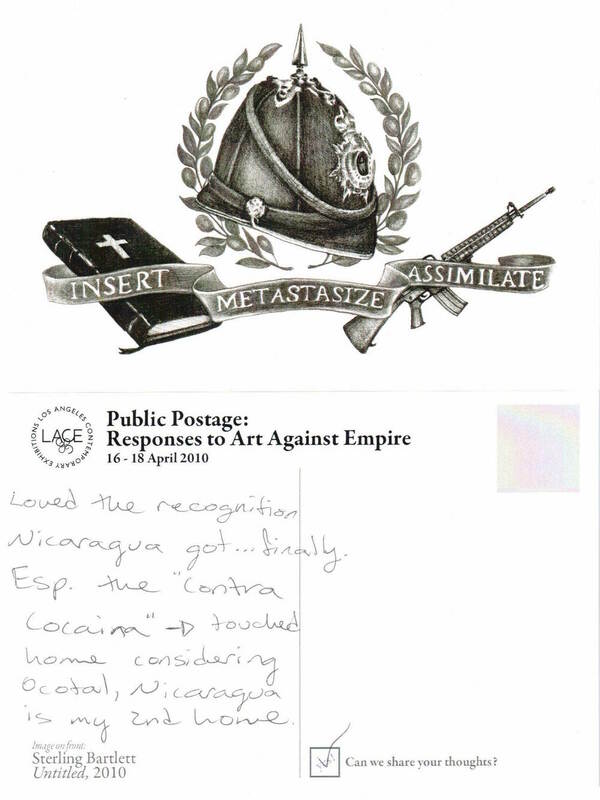 Intervention Since World War II organized by the Center for the Study of Political Graphics at Los Angeles Contemporary Exhibitions (LACE). Visually provocative and politically driven art has been used for centuries as instruments of activism, dissemination, and action; publicly mounted and displayed it is a powerful step against regimes of repression and censorship. In keeping with this tradition, the curatorial team commissioned a series of four unique postcards designed by artists Sterling Bartlett, Finishing School, Daniel Ingroff, and Michael Obert in response to both specific works and thematic considerations of the exhibition. A postcard rack was put on display in the center of the exhibition. Viewers were invited to record their own responses, thoughts, comments and/or concerns on the postcards. 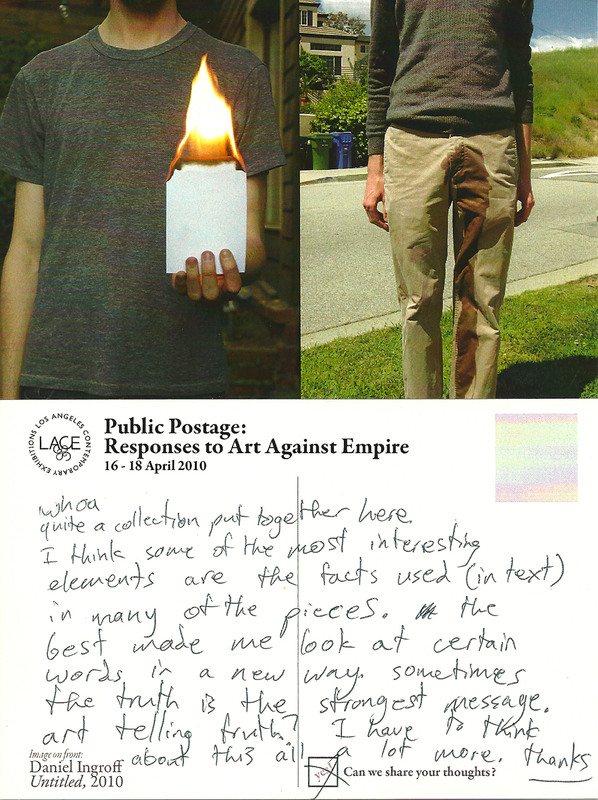 The postcards were then mailed to the artists of both the political graphic posters and the postcards. Some postcards were addressed to LACE and other institutions. PUBLIC POSTAGE, in extending the audience's engagement, aimed to expand the dialogue between the viewer, artists, and geographical or institutional locals. In uniting a multitude of voices on the issues that affect us all, the visual imagery created by the artists should not be seen as limited responses confined to a singular exhibition but as sustained engagements considering the broader issues and conditions surrounding the current political climate. They are both a figurative and literal call for action.